The potato famine hit Ireland from 1845-1852. Crops failed in successive years, caused by a blight that destroyed both leaves and the edible potatoes at the roots. About one million people died of starvation. By 1920 the Irish population was barely half of what it had been in 1840. Lower birth rates and the estimated two million who emigrated caused this decline. The largest group of immigrants left Ireland 1845 to 1852. It was on December 24, 1849, that the ship Dalriada dropped anchor at the Port of New Orleans, then in the district of Mississippi. Peter Dillon, 50, and his ten children were eleven of the 413 passengers on board, a mixture of English, Scotch and Irish men, women and children. According to Master William Kelly, two passengers died at sea – but they are not named. The Dalriada was a 3-masted, square-rigged ship, built at Quebec, by George H. Parke, in 1849, 1507 tons, 184 x 34 x 24.7 feet. William Kelly was master through 1852. Was this trip from Liverpool to New Orleans her maiden voyage – or possibly the second voyage since she would have traveled from Canada to England. Peter Dillon was born in County Limerick, Ireland, about 1787. He died January 24, 1885, at the age of 98, according to his gravestone. The census records put his birth date closer to 1795. It is quite possible Peter’s wife died due to the potato famine, although death could have been due to several things – childbirth, illness, disease. The ten children on the ship with Peter were Michael, 20; John, 18; Edward, 18; Thomas, 17; Matthew, 16; Ellen, 16; Margaret, 8; Elesia, 4; Peter, 3 and Pat, 2. The family probably took a steamer up the Mississippi to Maysville, since that was where they lived during the 1850 census. However, two of the children are not listed in the census, Edward, 18, and Pat, 2. Could they have been the two passengers who died on the voyage? Or were their deaths from other causes? I cannot find the family in the 1860 census, but in 1870 Peter, 75, is living with John McGrath, 48, a blacksmith, born in Ireland; Ellen, 46, Peter’s daughter; and their five children – Mary, 14; William, 9; John, 6; Thomas, 4; and Alice, 7. Ellen Dillon married John McGrath December 25, 1855. I could not find Peter in the 1880 census. 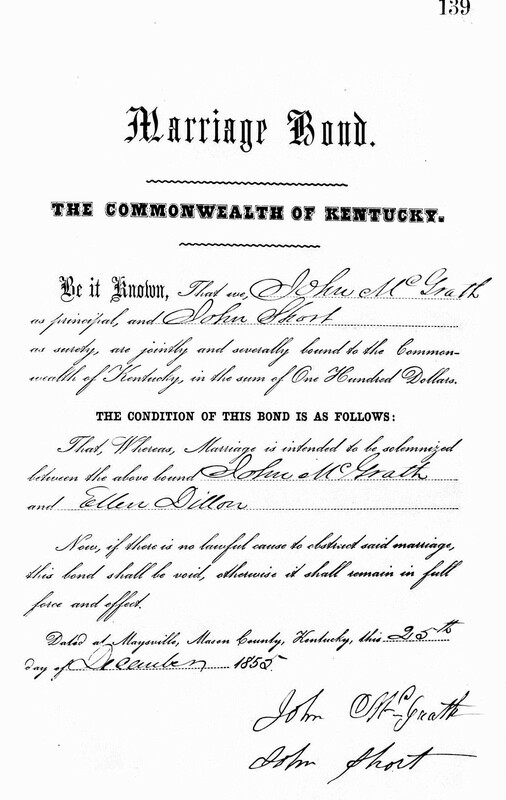 Peter Dillon was considered the oldest citizen in Flemingsburg, Fleming County. The paper, along with his gravestone, says he was ninety-eight years of age. Considering I have lived in central Kentucky all my life, Peter Dillon was a world traveler! 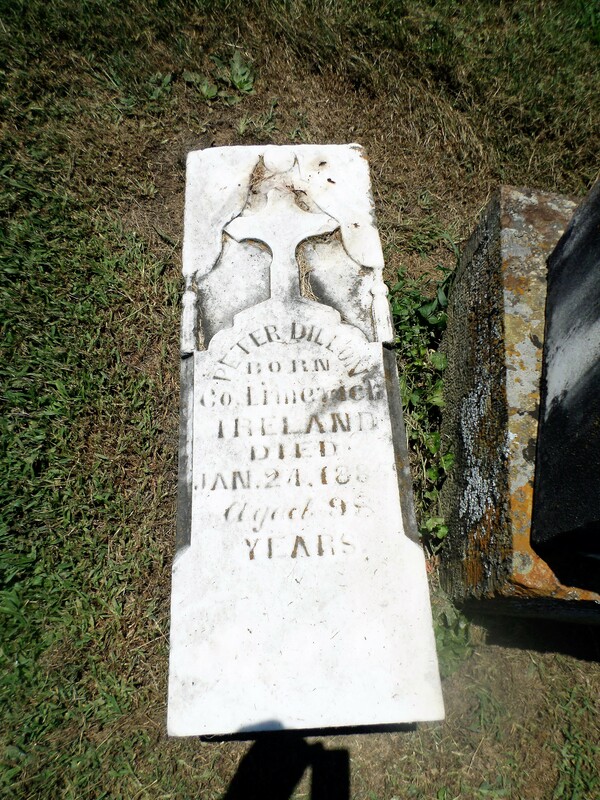 Peter Dillon, born County Limerick, Ireland, died January 24, 1885, aged 98 years. Flemingsburg Cemetery, Fleming County, Kentucky. The stone has fallen from the pedestal you see beside it.